My name is Laura Faye Clubok. I am a registered and licensed occupational therapist (OTR/L) and a certified weight trainer with the International Weightlifting Association, who also has a congenital hand anomaly. I earned my undergraduate degree at Harvard University and my master's degree in occupational therapy at the Boston School of Occupational Therapy at Tufts University. My passion for occupational therapy stems from my own experiences growing up without fingers on my left hand. My story, "A Debt Repaid," has been published in the inspirational book, Ordinary Miracles: True Stories About Overcoming Obstacles & Surviving Catastrophes, edited by Deborah R. Labovitz PhD, OTR/L, FAOTA. The book is a compilation of 96 true stories about everyday miracles experienced by ordinary people. My story, which is Chapter 26 of the book, recounts my experiences receiving occupational therapy as a child and my more recent experiences providing occupational therapy services as an adult, to a little girl named Emily who has a hand anomaly just like mine. The name of my private practice is (surprisingly) "On the Other Hand Therapy". Since becoming an OT, I have been working with children with special needs and typically-developing children. I have and continue to work with wonderful families who care about their children immensely. 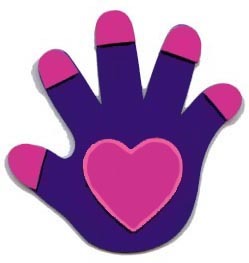 This website is intended to provide information, support, and suggestions for parents, relatives, and friends of children with hand anomalies. My commitment to developing this site grew from my desire to share much-needed information with families that wasn't available for my parents when I was little. I have drawn upon my dual experiences as an OT and as an adult with a congenital hand anomaly, integrating my personal and professional experiences to provide a realistic, helpful, and inspirational perspective. Please share this site with your child's physician and any health care professionals who may be helping your child. I encourage you to revisit this site to check for updates. I plan to write additional sections. In case you are wondering, the information contained on this site is not presently available in book format. If you know a publisher who might be interested, please let me know. And who may stand in the place of His holiness? The clean of hands and the pure of heart. The second source is the motif, widely used in Middle Eastern cultures, known as the chamsa. It alternately represents good luck, the hand of God, and the hand of healing. 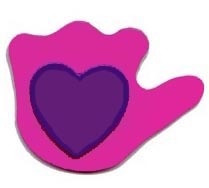 It is often depicted as an upside-down hand in conjunction with other symbols, such as hearts. Here's the story behind the logo design: One day, after a difficult appointment with a hand physician who just didn't get it, I cut four fingers off of a pre-made FunFoam hand and glued a heart in the middle of the palm. I cut the tips of the fingers to make nails for the intact hand. 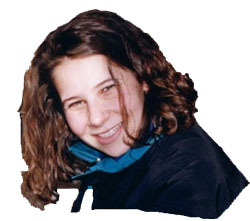 I scanned the hands and Debbie Rosenfeld, my website designer, re-colored and digitized the images. Then, I glued the foam hands onto my work bag. When children ask me what happened to my hand, I use the foam hands to explain rather than my actual left hand. I encourage parents of children with hand anomalies to do this art project with their children, to enable them to create their own hands. FunFoam is available at most craft stores and dollar stores in sheets as well as pre-cut shapes, some with sticky backings. Kids like FunFoam, and they like art projects. Have fun! I have noticed that many parenting books and websites have hidden agendas. These agendas may be to urge you to buy a specific product or try a particular behavioral plan. I'm going to be very upfront about my agenda, because I think that my readers have a right to know what I advocate. Simply put, my message boils down to this: I want children with hand differences to be children; I don't want them to be heroes. I think that too much pressure is put on children with hand anomalies to be independent, do everything that everyone else can do, prove how "normal" they are, never ask for help, and never admit that something is too hard. All information contained on this website, including, but not limited to, text, graphics, logos, and button icons is copyrighted and may not be used in any way, in whole or in part, without ontheotherhand.org's prior written consent, except in the case of brief quotations embodied in critical articles and reviews; or as provided by US copyright law. To obtain written consent, email . Please note that every child's situation is unique. The information contained on this site is for informational purposes only, and is not meant to serve as medical advice or to replace consultation with qualified health professionals who are familiar with your child's individual medical needs. As always, be sure to consult with your child's medical practitioners before beginning a new exercise or treatment program. Ontheotherhand.org will not be liable or responsible for any damages or injuries caused by use of the site (such as omissions or misstatements). Also, just as a responsible medical doctor will not prescribe treatment over the Internet, neither will I offer therapeutic intervention by e-mail. I appreciate your understanding! Some names have been changed to protect the identity of minors. Ontheotherhand.org contains links as a convenience to you. Such links should not be considered as endorsements of other sites, products, or services. No one at ontheotherhand.org receives any compensation for our advice or product recommendations. I want to thank all of the people who have taken the time to email me about this site. I especially want to thank all of my clients and their families, my teachers, my colleagues, and my mentors, in the fields of OT and beyond, who have guided my learning over so many years, making the development of this website possible. I wish that I could list, by name, all of these amazing people, as well as all of my family members and friends who continually inspire me and convey their confidence in my ideas and visions. I specifically want to thank several special people by name for their outstanding contributions. Jochele Kennedy, a responsible, experienced, and excellent sitter, gave loving attention to my daughter while I worked on the site. Without her caring and help, this never would have gotten written. Debbie Rosenfeld, web & graphic designer and editor extraordinaire, revised and updated my site to give it a professional - yet accessible - look. Ivonne Ramirez volunteered to translate the site into Spanish so that more families would be able to access the site. Thank you, Ivonne, for your vision and hard work!! If you know anyone who might be interested, send him to enlaotramano.org. Natalie Weinhaus created and designed many of the graphics on these pages. Newly-married and newly-pregnant, she volunteered to design and create fabulous images. My husband and best friend, Kenneth Clubok, continually badgered me with, "Have you worked on the website yet?" and spent hours upon hours initially creating this site. Please see a poem that I wrote to Ken. Patricia Burton, RN, MSN, founder of Moving Mountains for Kids, a healthcare and educational consulting company, gave me permission to adapt her suggestions for handling grief and loss. Priscilla Hayden-Sloane, my level II Fieldwork supervisor during my OT master's degree program, is an amazing teacher, role-model, and friend who guided me in learning to work with children. Dr. Sharan L. Schwartzberg, Chair of the Boston School of Occupational Therapy, was my mentor and boss while I was a teaching assistant for her course. Her love of OT is infectious and inspiring to all whom she meets and teaches. © 2004. Laura Faye Clubok, MS, OTR/L, On The Other Hand Therapy.